Soweto 1976: An Audio History Thirty years ago, the uprising of a group of schoolchildren forever changed South Africa's history. What began as a protest against a government education policy became a watershed moment in the fight against apartheid. 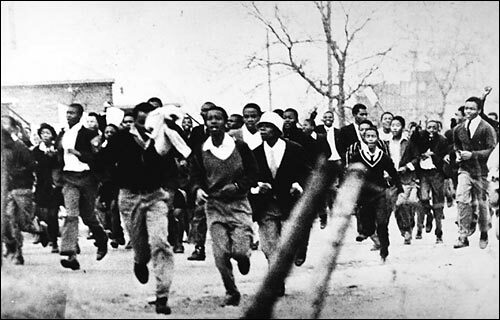 A student protest by children in the poor township of Soweto proved to be a watershed moment in the fight to dismantle apartheid in South Africa. 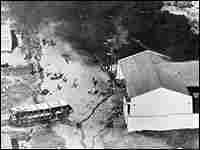 Police opened fire on the student protesters in Soweto, killing 23 and injuring hundreds. Unrest began to spread across the country. 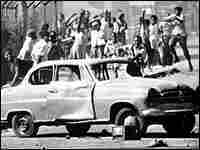 South African rioters in Soweto use cars as roadblocks, June 21, 1976. More than 500 people are killed over the next eight months, a quarter of them under age 18. 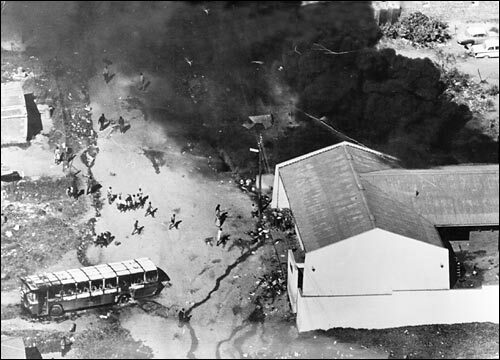 Thirty years ago, the uprising of a group of schoolchildren changed South Africa forever. For decades, the whites-only government of South Africa had brutally enforced a policy of racial segregation known as apartheid -- and just as ruthlessly crushed any opposition. By the 1970s, an entire generation of anti-apartheid fighters had been silenced. Many were killed. 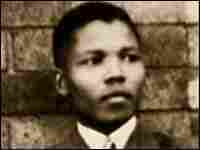 Others, like Nelson Mandela, were in prison or in exile. But on June 16, 1976, students in Soweto township outside Johannesburg decided to hold a protest against a government policy mandating that all classes be taught in Afrikaans, the language of South African whites. Learn more about the interviewees who share their memories of Soweto. What started as a student demonstration exploded across South Africa, helping to change the course of the nation's history by galvanizing the struggle to dismantle apartheid. Producers Joe Richman and Ben Shapiro present this audio history. Government Newsreel: Cape Town glowed in warm, sunny weather today for one of its most colorful ceremonies, the opening of Parliament. It was opened at noon by the president, Mr. Fouche. Sonny Venkatrathnam: All political movements were banned. Everything was quiet, ostensibly. In terms of the struggle, we were in the doldrums. Ahmed Kathrada: They had virtually crushed the movement in South Africa. It was a bad period for us. Murphy Morobi: A number of people were being killed in detention. People were very scared to get involved. Nthato Motlana: And yet, under the surface, it continued to bubble. Bongi Mkhabela: They had locked up Mandela in jail. But they hadn't looked around to see where are their children and what are they doing? Nthato Motlana: The student movement, under the leadership of people like Steve Biko, there arose a group imbued with the spirit of black consciousness. Steve Biko (Archival): Black people need to defeat the one element in politics which is working against them. And this was a psychological feeling of inferiority. Thandi Modise: There was an emergence amongst black townships of self-definition. Do you take what your father has taken or do you stand up for what you think is right? Strini Moodley: The reaction of the older generation to us was, "Are you guys mad? Those guys are gonna come blow you away. They're gonna kill you." And we said, "No, first thing is you stand up and speak your mind as any normal human being has the right to do." Nthato Motlana: There was a state of unease throughout the country. You could feel it. You could feel that something had to give. And it happened on June 16. Radio Broadcast: Teach yourself Afrikaans. Good evening listeners. Let us start off by getting to know all the Afrikaans sounds -- "lag, dag and nag." Nthato Motlana: Afrikaans is a hybridization, if you like, of Dutch. Radio Broadcast: "Lag, dag and nag." Thank you, easy isn't it? Nthato Motlana: It's a language that was used by the rulers. And the black children hated Afrikaans with a passion. Government Newscast: 1975 and Afrikaans is exactly 100 years old. To pay homage to the Afrikaans language, pupils of the school present a play in Afrikaans. Bongi Mkhabela: Every school day began with an assembly of all the kids. One day there's an announcement. Bongi Mkhabela: As of today, every subject would be taught in Afrikaans. And the teacher walks in, history becomes geskiedenis. And we were all like, "What are you talking about?" And our teacher was standing there trying very hard; he has an Afrikaans dictionary on the one hand, and he was trying to translate. And in complete exasperation, the teacher says, "You know what, I don't know." And that didn't work, whole classes failed. When they did that, they actually mobilized the entire school generation because it represented everything that the oppressors stood for. This was a battle we had to fight. Announcement: Soweto, a complex of black townships on the southwest corner of Johannesburg, with an estimated population of one-and-one-quarter million. Every day, Sowetans pour into white homes, offices and factories in Johannesburg, leaving the township to the children and the teenagers. Bongi Mkhabela: June 16, 1976, starts very much as an ordinary day. Murphy Morobi: Our school started at 8 a.m., as the tradition has had it, with the singing of the Lord's Prayer: "Our Father who art in heaven, Hallowed be thy name, Thy kingdom come." But on this day, instead of the Lord's Prayer, we sang "Nkosi Sikelel' iAfrika," "God Bless Africa," which was our signal tune to march out of the school premises. And we all joined at the time. Newscast: At 8:15 in the morning, and precisely according to plan, students simultaneously marched out of five schools in Soweto, intending to protest the Afrikaans issue in a mass meeting at the Orlando Football Stadium. Bongi Mkhabela: We had hundreds, probably thousands, of schoolkids. And we thought we knew everything there is to know about managing protests. The first thing we worried about was that everyone must be accounted for at all times. So we then had chains of five kids and make sure you are holding somebody's hand all the time. And if you are not holding somebody's hand, get worried, because where is your partner? Nthato Motlana: Then it became really a torrent, a sea of young, black faces. Masses of students, I mean, we'd never seen such a demonstration in many, many years. And at that point, the police tried to stop the march from going on to Orlando Stadium. Bongi Mkhabela: I've never seen that many police. And you didn't only have police at that time, you had the Defense Force. So you actually had the Army. Nthato Motlana: They intervened by, first of all, setting dogs. And I saw these police dogs set onto these kids, man, and I saw moments of real courage, especially from the girls. Bongi Mkhabela: I mean, this is a group of kids, kids with shining black shoes and little white socks and teeny little tunics. And they are singing freedom songs, holding one another. We actually looked cute. It's unbelievable to think that anyone could have stood firm on their feet and actually shot into that crowd. Murphy Morobi: Your initial thought is to secure yourself. And then you look around you, you see girls running, screaming. Bongi Mkhabela: We had hundreds of schoolkids running helter-skelter, running all over the place. We had planned for water pipes; we had planned for maybe rubber bullets. We had not planned or thought that it's possible that people were actually going to be killed on that day. Newscast: The teeming black township of Soweto has finally erupted into the violence that whites have been fearing for years. At least two of the dead fell when police opened fire on a crowd. Bongi Mkhabela: I don't know why they decided to shoot. I can only think it was black life and it didn't count. Life of African people had always been cheap. Murphy Morobi: I mean having grown up in the township, you know, you heard gunshots. But the sounds of bullets flying, you know, you standing up on top of an abandoned car and suddenly you hear bullets thudding on the side, you know. Not knowing where the next one is going to come from. You just get a sense of how fleeting life can be, and you feel, you know, how are you going to deal with it tomorrow? Newscast: Within 36 hours of the start of a march by 10,000 pupils in protest against Afrikaans, 29 people were dead and 250 injured. Nthato Motlana: The mayhem went all over Soweto. The following day, it went on all over the country. And really, South Africa was on fire. Newscast: Here in Durban, three police baton charges were needed to break up a 2,000-strong demonstration at Claremont's native township. Johnny Makatini: It was like a country at war. And I'll never forget, listening to my radio as the demonstrations were spreading like a prairie fire, and it occurred to me that the regime that we thought was powerful seemed to be terribly disorganized, panicking. 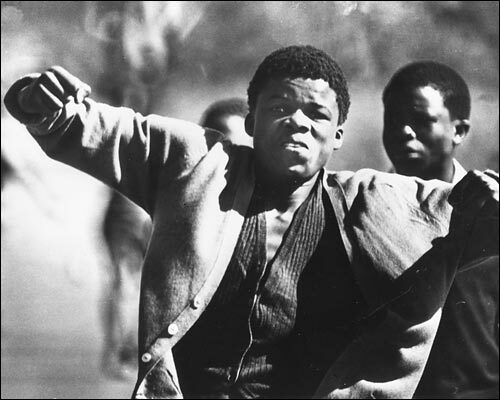 Murphy Morobi: For days, Soweto became, a smell of tear gas. And the kids got to know how to counteract tear gas -- take a piece of cloth, wet it and hold it over to your nose. Thandi Modise: When you see your friends being shot at for just walking in the street, it does something to you. And therefore, you would look around. What are the alternatives? Do I become like my mother, forever under the yoke of apartheid? The alternative was for me to not be like my mom, great as she was, but to go and fight. Nthato Motlana: And '76 really represented, in many ways, divorce between black children and their parents. Bongi Mkhabela: It was clear in all of us kids, at that time, that peaceful struggle, negotiated settlements were totally out of the question. 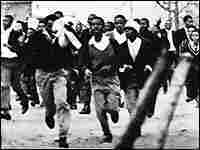 Many of the young people who were on that march left South Africa for armed forces and for an armed struggle. Thandi Modise: We the youth have gone into foreign lands to learn how to fight. Mommy, please keep quiet, even if I die, you will know that I have died fighting for our country. Strini Moodley: 1976 was the turning point. Black people had made up their mind. We're not taking this anymore, and South Africa was never the same again. Murphy Morobi: Many years later, after I went to jail, you know, for the events of the 16th of June, there was always at the back of my mind, you know, the images of Soweto. The sense of fear there in everyone's eyes, and you can even still smell the tear gas when you just think about it. It is something that you would never want to wish on any society. 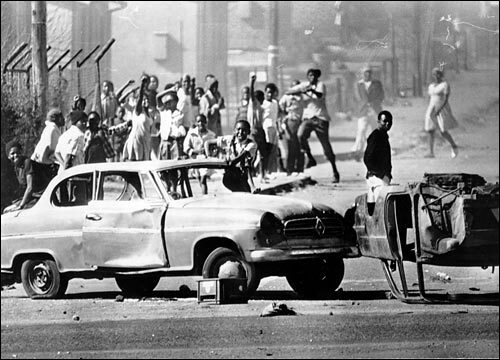 In South Africa, we carried with us the scars of June 16, 1976. The Soweto uprising was the beginning of a new era in South Africa. But it would take almost two decades before apartheid finally fell. In 1994, in the country's first truly democratic election, Nelson Mandela became president of a new South Africa.